Sympathetic ophthalmia (SO) is a rare, bilateral, nonnecrotising granulomatous panuveitis that may develop after exposure of intraocular contents to the immune system, i.e., trauma, followed by a latent period and the appearance of uveitis in both the injured and non-injured eye. Both eyes are affected, with the injured eye usually presenting with uveitis before, and more severe than the uninjured eye. Its occurrence is much more likely to follow globe penetrating injuries (0.2% to 0.5%) than after intraocular surgery (0.1%), and even lower with pars plana vitrectomy (0.01%).1 It has been theorised that infection is protective against sympathetic ophthalmia.2 To our knowledge, there are no reports on SO following intrusion of scleral buckle at present, whether from an infectious cause or not. We are reporting the first documented case of SO from infection and eventual intrusion of scleral buckle. Infection has not been protective against SO even if the exposed uveal tissue is underneath the scleral abscess. Vigorous steroid therapy and early surgical intervention has led to good visual outcome. A 70-year-old female was referred to the Uveitis clinic of the Philippine General Hospital due to sudden onset blurring of vision in the left eye. She was diagnosed with idiopathic macular hole in both eyes in 1995. She underwent vitreoretinal surgery and subsequent scleral buckling for retinal detachment of the right eye on the same year. 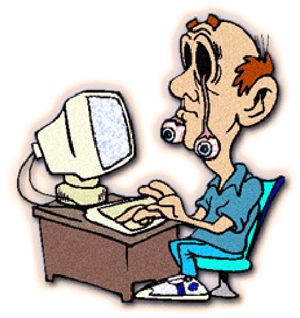 Since then, there was gradual, progressive loss of vision in the operated eye. The vision in the left eye was stable at 20/200. In 2008, she presented with acute-onset blurring of vision in the left eye and right-sided eye pain. 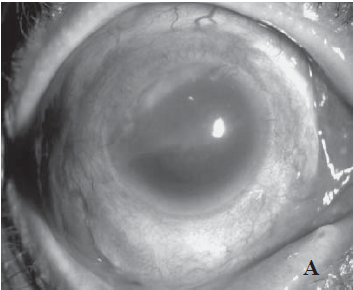 Grossly, there was note of intrusion of the scleral buckle with surrounding scleral abscess. Visual acuity by the left eye was limited to detection of hand movements and with no light perception by the right eye. Slitlamp examination of the right eye revealed exposed scleral buckle with abscess from 6 o’clock to 4 o’clock position, ciliary injection, fibrin in the anterior chamber, +4 cells, +4 fl are, 2.5 mm hyphema, 360° posterior synechiae and cataractous lens. There were areas of exposed uveal tissue beneath the conjunctiva. In the left eye, there was note of medium- to large-sized keratic precipitates on the endothelium, +3 cells, +3 fl are, fibrin in the anterior chamber, 360° posterior synechiae, bowing of the iris plane and cataractous lens. Both eyes had no view with indirect funduscopy (Figs. 1A and 1B). Fig. 1B. optic section of the left eye showing sympathetic granulomatous anterior uveitis. The patient was given intravenous Dexamethasone for 3 days, topical Prednisolone acetate, Atropine sulfate, Gatifloxacin and posterior sub-Tenon’s injection of Triamcinolone on the left eye. The patient also underwent enucleation of the right eye. On the 11th hospital day (9th postoperative day), the visual acuity of the left eye improved to 20/200 with quiescence of the uveitis. Laboratory tests showed neutrophilic predominance on complete blood count and an elevated erythrocyte sedimentation rate (ESR). Chest x-ray, tuberculin skin test and rapid plasma reagin (RPR) tests were normal. Vitreal microbiologic studies of the enucleated eye revealed heavy growth of Enterobacter hafniae. Histopathology showed diffuse thickening of the uveal tract due to granulomatous infiltration, with lymphocytic predominance and few epithelioid cells. There were no Dalen-Fuchs nodules appreciated. There were also areas of scleritis but with absence of infl ammation on the choriocapillaries. The pathophysiology of this disease is yet to be well understood. There are several hypotheses. One postulated that the inflammatory process spread from the exciting eye to the sympathising by way of the optic nerve and chiasm. Another and more accepted hypothesis is the exposure of ocular antigens to the extraocular lymphatics, inciting inflammatory response in both eyes. As in this case, the presence of exposed uveal tissue in the area of the intrused scleral buckle from infection may have led to SO. 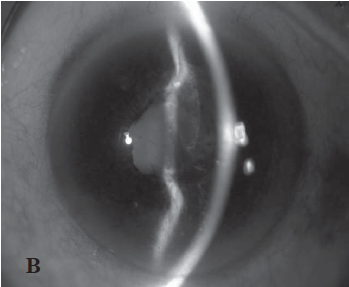 This reports the first documented case of SO from infection and eventual intrusion of scleral buckle. Infection has not been protective against SO even if the exposed uveal tissue is underneath the scleral abscess. Vigorous steroid therapy and early surgical intervention has contributed to good visual outcome. Castiblanco CP, Adelman RA. Sympathetic ophthalmia. Graefes Arch Clin Exp Ophthalmol 2009;247:289–302. Rao NA, Wong VG. Aetiology of sympathetic ophthalmitis. Trans Ophthalmol Soc U K 1981;101:357-60.